I was standing under an eave watching the rain come down when Pat picked me up to take me to the Parks Half Marathon start line (have I ever mentioned that my boyfriend is the best ever?). This would seem an inauspicious beginning, I needn't have feared - it was to be a perfect day for running. The Parks Half begins at the Metro station in Rockville, MD, about 15 traffic-free minutes away from where I live. It's a small-ish affair, run by a county road running association, and there's no big expo or anything. Still, it's enough of a local running community institution that it attracts a decent crowd, and all your basic needs are there - port-a-potties, water stops, med tents, pacers. I found my friend Sarah while walking to the start area, and we took a moment to consider our start time. The Parks half has no corrals, but you can get an idea of your preferred placement based on where the pacers are standing and then groups are released in waves. I had originally planned to locate the 2:15 pacer, but I didn't see that sign. I DID see the 2:10 pacer, and despite the fact that this was rather a stretch for me I figured what the heck, why not go for it? Sarah was uncertain about this pace herself but decided to stick with me. Important Plot Point: up to that moment my PR for the half was 2:14:39. The race starts with a small road portion that is almost all downhill, and our pacer warned us not to use up too much juice too soon therefore. I managed to stick with her for the first two miles before losing her (and Sarah) and the first water stop. From then on it was back to status quo: on my own! It was also time for the trail. The course winds through the various parks of Montgomery County, including Rock Creek Park and the Capital Crescent trail. I wouldn't describe any of it as hilly, but it definitely wasn't completely flat; early on in the course was High Five Hill, which was not too long but fairly steep. Those who successfully made it to the top were rewarded with high fives from kids wearing white Mickey gloves. Naturally this made me feel much more at home. On that note: there wasn't a ton of entertainment on the course, barring a smattering of spectators and unofficial acts (shout out to Captain Jack Sparrow and Mr. and Mrs. Incredible!). But there was a pianist, so that's new, I guess? Aside from that, you're running through woods and past parks. Interesting note: none of these are closed. This means that a lot of people there to use the park are confused, and also there were people out for training runs on the same trail, generally going in the opposite direction. I didn't witness or hear about any collisions, though, so I suppose that's all right. The last two miles or so are a verrrrry gradual uphill, known as The Silencer. I actually didn't think it was that bad, as the upward incline was reasonably gentle, but it was certainly long. I can't say I had much left in the tank and The Silencer wasn't helping, but I was also aware that my GPS watch was telling me good things and it was NOT quitting o'clock. 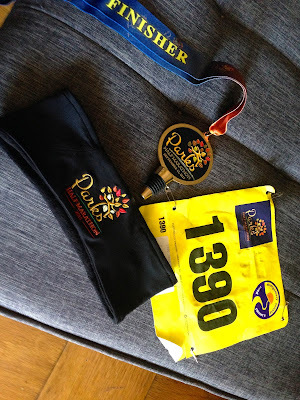 I kept it rolling and - lost pacer or no lost pacer - finished at 2:10:35. This is per my watch, as the official times aren't out yet, but still: PERSONALLLLL RECORDDDDDDD. Get a load of these split times! Hardly super speedy by comparison to many and I've still got a lot of work to do if I ever want to get in on this whole "negative split" thing people like to talk about, but pretty consistent. Not too shabby for me! I wish I could compare these to my previous PR split times, but alas, during the Tinker Bell Half I forgot to start my watch until a quarter mile or so in. Finishing came with some snazzy premiums, including a nice fleece head wrap and a medal that doubles as a bottle stopper. Top that, runDisney! There was water at the finish, but sadly no Gatorade. :( There was also a ton of free food if you were willing to stand in line for it, but it was all lunch food. I do not want Italian sausage and pasta with marinara at 9:30 in the morning, thank you very much. Pat picked me up and we had breakfast at Tastee Diner with his boss who had also run. WAFFLES FTW. And then we walked home, because the race finish was in downtown Bethesda and THAT'S WHERE I LIVE. Request: all races should end where I live from now on. So yeah! That was a very successful race for me. But here's the thing: I didn't at any point feel GREAT. It wasn't a super tough slog or anything. I felt mentally and physically strong. But at no point was I like, WHEEEE! I'M RUNNING! I'M A BEAST! I was definitely working the whole time. Add to that the fact that the course was not 100% flat and I am pleased to say that I am cautiously optimistic that this is not the end of PRs for me. Marine Corps Marathon, I'm coming for you. Whaddya say to 4:45? This looks like a great race! I've still never run it! Eventually, we'll find ourselves at the same race, right?